Resolve, "Theism is needed to make sense of everything." Wednesday, March 7th, 2007 A.D. Affirmative: Dr. Paul Herrick, Ph.D in Philosophy and Logic. Professor of Philosophy and logic at Shoreline Community College. Author of textbooks such as, "The Many Worlds of Logic." Author of the "Contra Carrier; Why Theism Is Needed To Make Sense of Everything," essay. Negative: Samuel Thomas Poling. Champion of the MPHS high school debate tournament (best I got, sorry). Ally of Richard Carrier. 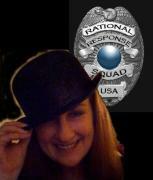 Author of "The Irrationality of Theism," essay as heard on the Rational Response Squad radio talk show. Long time passionate fan of logic. Logician atheist libertarian humanist. Break a leg, my friend! Go and give that PhD something to think about. I'd say giv'em hell, but it would seem that he would be the one informing you of some sort of afterdeath threat. That is a really broad topic though, he could go into anything from evolution to scripture to cold hard logic. Congratulations. It takes some guts to go against a theistic philosopher.